The pictures opposite show the devastation after a robbery of my Home Cinema shop in Manchester. Horrific aren’t they? However, these pictures were not taken on Tuesday following the rioting and looting in the North West of England, they were taken exactly two days before Christmas day, 2003. As I listened to Salford, Manchester and London traders on Sky News describing how their businesses and livelihoods had been destroyed by criminals during the violence last week, the memories of 2003 came flooding back. Unlike some shop and business owners who were targeted in these recent attacks, I had no warning whatsoever of what was about to happen. We were just about to complete a busy Christmas period, however we still anticipated two good days of trade before we closed for the Christmas break. Personally, from a business owner perspective, I was looking forward more to our New Year sales. We had stocked up accordingly and were expecting brisk business. I can’t recall the exact time I received a call from the alarm company, but I believe it was around 9pm. While always a worry, our alarm could be temperamental, and on occasion had been set off by vibrations to the shutters or inebriated individuals falling into the shop front. However, I always made haste to get to the shop as quickly as possible “just in case”. As I approached my shop, I instinctively knew something was wrong. A traffic jam on Bury Old Road at 9pm on a week night? My heart sank. Fearing the worst, I bypassed the traffic by driving on the wrong side of the road (it was impossible for anything to be coming in the other direction, as I soon discovered). On abandoning my car half on the road, half on the pavement (facing the wrong way!) I could see the reason for the traffic jam. A pickup truck that had been used to “ram raid” my shop had reversed back into the road, completely blocking it in both directions. A scene of complete devastation awaited my arrival. The alarm was sounding incessantly. The truck had been driven straight through the shutter, demolishing the small wall below the windows. 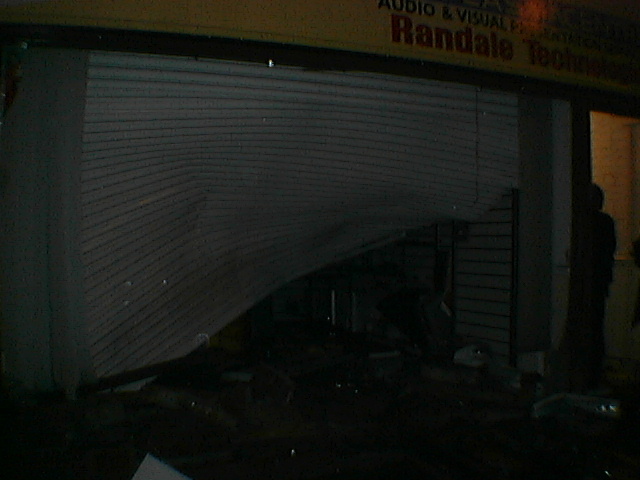 Inside, the energy of the truck and movement of the metal shutter had obliterated the first few rows of DVD Players that were previously sitting on display. Outside the front door, a 42” plasma TV was abandoned, smashed. Police were on scene and it transpired that a squad car had been close by when the shop was attacked, but unfortunately the perpetrators had managed to evade capture. I was heartbroken at the complete and utter destruction of the successful business that I had built up from a “back bedroom hobby” to one that employed two people full-time, on a good wage. Perhaps the hardest job was the telephone call to my father (who had left his previous job to join me and help us expand). In a bitter addition to the horror, when the Police allowed us entry to turn off the alarm system (still blaring), my dad slipped on the debris and broke his arm. The criminals who robbed us and destroyed our livelihoods that Christmas in 2003 are no better than the mindless yobs who decided to get whatever free “stuff” they could and damn the consequences to others. Many hard working shopkeepers, business owners and shop staff have lost their primary income and in some cases (due to indiscriminate arson), their homes as well. I know how they feel. They feel the pain and anguish I felt that night 7 and a half years ago and they want the guilty to be caught and punished. Justice yes, swift justice if possible – but it does not have to be rushed. The Police have always had my admiration and I am incredibly grateful for their help in 2003 and earlier in the year (February) when our business was attacked by machete-wielding robbers who almost killed my father in a senseless attempted robbery which landed them exactly zilch in “swag” but scarred us both for life. The Police have an incredibly difficult job to do, with limited resources and an almost unlimited “clientele” to serve, protect and sometimes arrest. This is why I will not criticise the Police for the decisions they made in last week’s riots, nor in their inability to catch the idiots that attacked me and my business in 2003. I work alongside Police Officers and have heard, first-hand, their varied tales of arrests and incidents they are involved in on a daily basis. These days Police Officers are expected to put their lives on the line (and some have died doing so) with the risk that if they “get it wrong” they might lose their jobs, their pension, sometimes their liberty and maybe their lives. It’s a constant worry to Police Officers that the suspect resisting arrest today could sue them tomorrow for assault or “using excessive force”. We need to let our Police Officers take the gloves off and police as the moment or event dictates. If a riot is in progress, Commanders should have the ability and power to declare a different set of rules that apply for that particular problem. This would allow officers on the ground the freedom to do more without worry of being hauled before the courts themselves. I am not advocating giving Police Officers permission to do whatever they like, simply a return to proper traditional policing, rather than acting as a social worker. While I hope that we don’t see events like I experienced in 2003 and many other people experienced last week repeated any time soon, we should act now and free our Police from the “handcuffs” that the last two governments have shackled them with. Your comment though, thanks for posting it – I wholeheartedly agree. I was frightened, and that is the first time in 5 years of living in Langworthy that I have been genuinely afraid to walk on my street at night. I don’t wish to repeat that any time soon. The only people to blame are the morons who do this to their own community, not the police, immigrants, the rich, government and whoever else these people are trying to blame for their unacceptable behaviour. A lot of the Salford shops are owned by individuals struggling to survive the recession. These looters are totally ungrateful of the amount of money and effort that’s been put into the area to make it a better place for them to live in. They’re ungrateful of the fact they get a free council house to live in, bills paid for, benefits paid to them for simply signing a piece of paper… they’re so lucky compared to people in other countries!!! The benefit culture has created a generation that thinks they deserve everything for doing nothing. They have no work ethic. Rich people are rich cos they’ve worked bloody hard to get there – Alan Sugar wasn’t born rich. Do the looters have any idea how scared everyone was when they were looting? Old people, children, women, families… While they were looting and destroying the place, scared families were packing their possessions and fleeing in case their houses were next. The looters didn’t care about anyone else, they were having too much fun grabbing a ‘free’ bottle of plonk. Hope they enjoyed it because we certainly didn’t enjoy watching or hearing them that night.